This week the White House and the U.S. Department of Housing and Urban Development’s ConnectHome initiative will host a webinar for participating cities to share what they are learning as they convene stakeholders in their cities to bridge the digital divide. Austin Pathways’ Unlocking the Connection program is credited as a model for other programs; we were pleased to share the Austin experience at the White House in August. Starting slow and small helped us go faster. By January, we were fortunate to have the critical resources in place to provide Internet, digital literacy classes and computers to about 500 households. There was a desire to go fast and meet all residents’ needs as quickly as possible. However, the first critical decision we made was not to go fast. We agreed to start small. The more small-scale experiments we did, the faster we learned. We chose our smallest property, the 33-unit Manchaca Village, to do a pilot. We visited with Resident Council leaders, held special resident meetings, hosted Tech Feria including community partners like the Austin Public Library and the local school district, and distributed flyers. Residents engaged in learning with us. Then weekly, our five-member team shared what they learned in the field. The concrete measures each partner knows a lot about – Internet registration, skill building in class, how to evaluate progress and deploy computers – are still important. But now each partner has a sense of shared measures for success. That impacts family self-sufficiency. Human connection is the key to technology adoption. We learned every property and family is different. Our adoption approach has evolved from being high tech to being high touch. Today, given a stark choice between reaching 100 people with a Tech Feria and reaching one family at a time with a SWAT team comprised of representatives from EveryoneOn, Google Fiber, HACA Community Development staff, Austin Free-Net and KRLU, we tend toward the high-touch approach. For residents who have not adopted the Internet, and for whom Internet access may constitute the highest increase of quality of life, the greatest barrier to adoption is trust. Residents would ask, “Is this really free? Am I going to get a charge next month?” We found that we really needed to meet these residents multiple times, in different places, and leveraging our Community Development staff that they already trusted, to help residents feel confident they would have free basic broadband, and that through our Tech Starters classes and earn-a-device program, it would be a useful and beneficial connection. A few residents have safety concerns: They ask, “Can I really be safe online? Can HACA see what I’m doing on the computer if I use free Internet?” This process is a lot of dispelling myths, relationship building and trust. Leveraging free equipment and software exceeded our expectations. 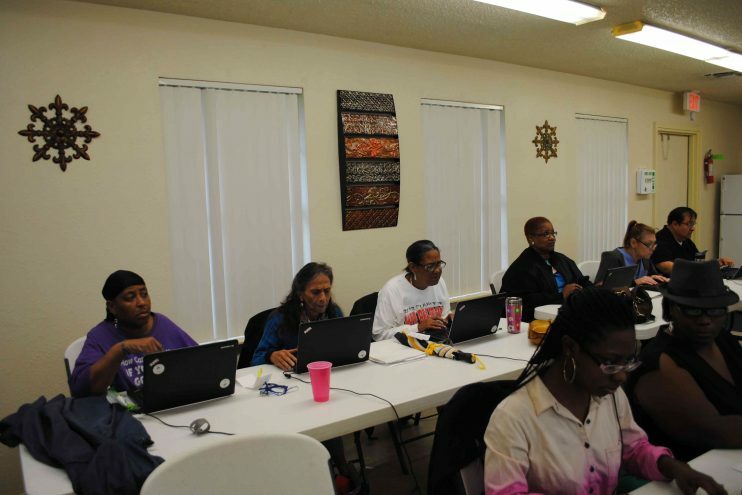 Earning a free device is a huge draw for residents to participate in digital inclusion. The device a resident earns is a retired campus computer lab desktop donated by Austin Community College. We had to decide what software we would put on the computers and how vulnerable residents would be to online safety risks. We debated about whether to try to raise money for Microsoft operating system licenses, but without virus protection software, which costs $69 per year, residents could be vulnerable. There is no cost for the operating system – which is similar to Microsoft’s – or the system’s applications and virus protection software. Some places that donate computers insist on shredding the hard drive to eliminate any chance of the computer’s data or software being stolen. This makes the computer almost worthless. But after some brainstorming for an alternative solution to keep the hard drives intact, Austin Community College agreed to let us refurbish the 600 donated desktop computers, thanks to a volunteer with a tech background and an interest in digital inclusion. Normally, new software must be installed on computers over a network. We called nonprofit refurbishers throughout the country, and ended up collaborating with one in Chicago to come up with a way to use a USB stick (show stick) that wipes the computer hard drive and installs a new operating system. Now these computers can be refurbished anywhere without a robust broadband network. We also knew Google Fiber would take a few months to install. So how could we make the computer useful while a resident doesn’t have Internet? We worked with World Possible, a nonprofit that collects free educational content, so while we’re refurbishing the hard drive, we could simultaneously install 32GB of educational content including Khan Academy for Schools, Wikipedia, Medline Plus and K-12 Textbooks. This content works even when the computer is not connected to the Internet. For us, this was important to ensure residents could use their computers from day one.